The town of La Ronge is situated near the geographic center of Saskatchewan, just north of the 55th parallel. La Ronge is connected to southern Saskatchewan by Highway 2, which continues north as Highway 102. La Ronge is served by the La Ronge (Barber Field) Airport and the La Ronge Water Aerodrome. 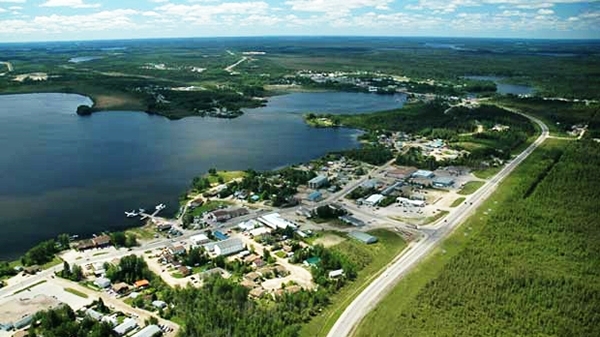 La Ronge is the largest community in Northern Saskatchewan with 5,671 people residing in the town itself, about 2,000 people on the adjacent lands of the LLRIB and some 1,000 people residing in the bordering settlement of Air Ronge. The LLRIB is the largest band in Saskatchewan, and one of the largest in Canada with a total membership exceeding 10,700. La Ronge began as a fur trading post and meeting place, incorporating as a northern village in 1905. It has seen the passage of explorers and legendary traders, such as McKenzie and Pond. Today the town is a vibrant, progressive community with diverse recreational, educational and business opportunities. The Northern Apprenticeship Committee and Northlands College deliver range of post-secondary education and training with an emphasis on the mining industry. The Lac La Ronge Indian Band (LLRIB) maintains its central administration office in the town. Its lands, 18 reserves in total, extend from farmlands in central Saskatchewan all the way north through the boreal forest to the Churchill River and beyond. The LLRIB is a Woodland Cree First Nation which prides itself on a commitment to educational opportunities, economic successes and social development work. It manages its own internationally accredited Indian Child and Family Services and has strong business ventures through its Kitsaski Management Limited Partnership and Keethanow Business Group. Cameco’s Northern Affairs offices are located in La Ronge and our nearest mining facility is the Key Lake operation, located 238 km north, by air. In June, 2017 the Lac La Ronge Indian Band (LLRIB) and Cameco announced the signing of a collaboration agreement to formalize their long-standing relationship. Since then, a Joint Implementation Committee (JIC) was formed and progress was made in developing roadmaps for workforce development, business development, community engagement and environmental stewardship and community investment. To provide more information to band members about the progress made under the collaboration agreement, the JIC has released its Collaboration Agreement - 2017 Progress Report.